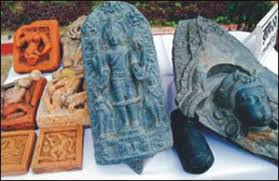 An ancient Vishnu idol has been found during excavation in an old village in Russia's Volga region, raising questions about the prevalent view on the origin of ancient Russia. "We may consider it incredible, but we have ground to assert that Middle-Volga region was the original land of Ancient Rus. This is a hypothesis, but a hypothesis, which requires thorough research," Reader of Ulyanovsk State University's archaeology department Dr Alexander Kozhevin told state-run television Vesti .